Supporting a social cause is probably the last thing on our minds when we are still absorbed in Chinese New Year festivity and with Valentine’s Day being just a week away. But even as we celebrate, let us not forget members of society who could be somewhat detached from the celebrations we delight in. And that they could benefit from a little love, be it from strangers they will never come to know. Co-founders of BloomBack, a social enterprise that aspires to bring smiles to marginalised women through the healing touch of flowers, hope to make this Valentine’s Day memorable for some of the members of its beneficiaries. 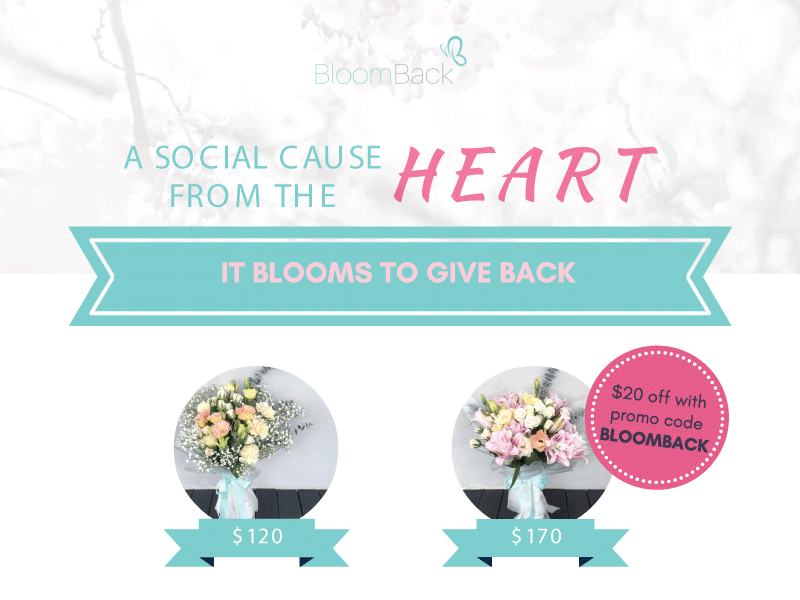 As part of its flower movement to positively impact lives, BloomBack is encouraging sales of flower bouquets for women who are receiving palliative care in hospice care centres, or those undergoing treatment for breast cancer. This charitable bouquet could be on top of another bouquet for special someone in your life. Recognising the good in BloomBack’s social movement, Articulat is contributing by doing what we enjoy doing in the hope that a little goes a long way. Many other businesses and florists have also come forward with their services. As much as it is about supporting the vision of two tireless advocates for a cause they believe in, it is about spreading love and hope to those who need it. For you, this could mean parting with a little to make a big difference to a recipient. To the woman in a hospice care or treatment room, your bouquet of flowers will give her reason to smile. And it will let her know that she is deserving of love and affection, even if she really feels physically depleted and emotionally drained inside. Apart from impacting lives, what also makes this movement beautiful is seeing businesses and individuals come together in a collective effort to bring comfort to often-forgotten communities. As an individual, you can partake in this flower movement as well. Make a difference by purchasing a flower bouquet for a love one or a beneficiary member who least expects a bouquet to come her way. And when she does receive your flowers, we are certain it will leave her touched beyond words. Touch someone’s lives with a BloomBack flower bouquet here.